When it comes to delicious, healthy, and quick recipes I jump all over that like white on rice and who wouldn't? With that said, one of my favorite breakfast meals incorporates all of that and gives me the energy I need to start my morning and fills me up super well until lunch. We are talkin overnight oats people, and if you have yet to jump on that wagon you totally should, well, we know you will after you try this tasty breakfast recipe below. Combine all ingredients in a glass container and mix well. Enjoy your overnight oats from the fridge the next day or at least 4 hours after placed in the refrigerator. **I really enjoy this with a sliced up banana as well and a tiny drizzle of honey. Are you a fan of overnight oats? What is your favorite flavor to make? haha yes this flavor particularly is delicious! No problem! Let us know what you think! Anything that keeps me from having to make anything in the morning is ok! Cinnamon is usually my go to flavor. I hear ya! This this perfect then! Ive recently pinned a shitload of these but have yet to make them. Im super stoked though, and apple banana cinnamon is definitely on my radar. These are perfect for those little mini mason jars! It is so good! Def worth trying! Yummy! 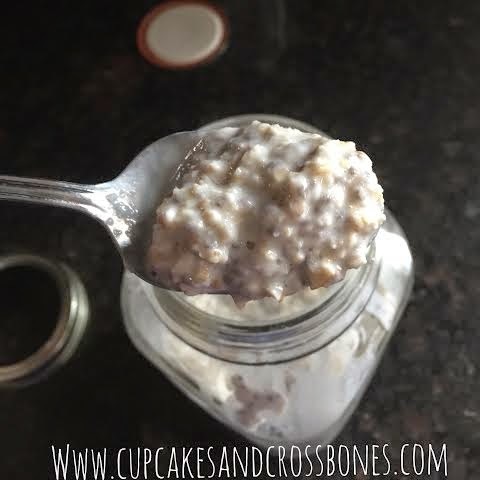 Overnight oats make breakfast sooooooo easy! I know right! I like! Yes, it's so easy, and healthy too!